There is a reason that victims are not allowed to be the judge or the jury. Take me for instance, I’ve done jury service. We all had a gut feeling the accused had committed the crime, yet when we looked at the case from a legal standpoint, it simply hadn’t been proven beyond reasonable doubt that he was guilty. The law is meant to be dispassionate. This is why if I am a victim I should play no part in the legal process. If someone hurt one of my children, they would be praying for hell to come and take them before I had wreaked my vengeance on them. Which is why I should have nothing to do with it. This is also why the influence and place of the “victim impact statement” needs to be more clearly expressed. There are people who believe that they can really have an effect on the length of sentence or chances of parole of someone convicted of a crime against them or a family member. 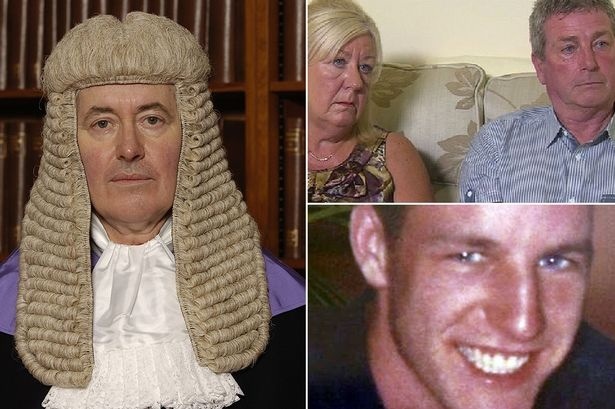 This was thoroughly out to bed this week by the comments of Graham White, a judge at the parole hearing of the killers of Colin McGinty, who had been stabbed to death in case of mistaken identity a decade ago. The victim’s parents had read out a statement talking of the “life-sentence of heartache and pain” they had endured since seeing their son die in hospital that night. They had done this over video link, and, thinking the video link was turned off, a White turned to a colleague and said how awful he felt for the family. “They make these statements thinking that they make a difference. But they make no difference. Somebody should tell them.” Judge White was made to apologise to the McGintys for this, and the Parole Board will be launching some sort of inquiry, but he was right; victim impact statements need to be seen for what they are. When the victim impact statement was brought in by Tony Blair it was suggested that the government wanted judges to “consider” the statement when making decisions. In fact, what should be happening is that judges need to put emotions aside and make the right decision, remembering that we are all equal before the law. Emotional these statements have been too. At first, many newspapers would reprint them in full. They were often heart-wrenching, with families and/or the actual victim opening their wounds and pouring out their feelings about what happened when the crime was committed and what has happened since. But then people began to wonder if they really did have the power to make a difference. If a family contained someone with particular writing skill (such as a journalist), they really could affect the outcome. People started to wonder if the more eloquent could actually extract better justice. But then people began to wonder what happened if the person who died or was attacked was not so popular or loved. Would a criminal do better to attack a recent immigrant who knew no-one here, or an autistic man? Of course they wouldn’t, because we are all equal under the law. So if the victim impact statement really did make a difference, something could be terribly wrong with us as a western democracy. Yet I am not suggesting in any way that the victim impact statement should be discontinued. Its therapeutic value should never be underestimated. To be able to tell the person who hurt you or your family how what they did made you feel is an important and valuable opportunity that night make a difference to your ability to recover but also to their ability to rehabilitate themselves. Many criminals forget that they are attacking real human beings, and how much their actions can affect others. But we should stop pretending that it does much more. Furthermore, if it does do more, then I would worry about our rule of law. « Nick Clegg and the politics of border controls.